The excitement starts building even as you approach the Tiger Palace Resort Casino. Enjoy the circular driveway to the main entrance with reflected light dancing on the surface of the surrounding laguna, then enter the palace and gaze over the casino main floor. This is it. 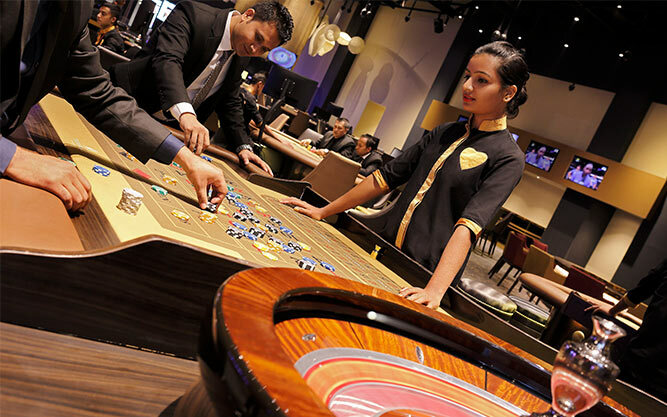 Over 50 expertly appointed gaming tables featuring classics like Blackjack, Baccarat, Roulette, Poker, Three-Card Poker and Stud Poker, plus Indian favourites Flush or Teen Patti. Watch the life in the casino and choose your spot, go straight for the kill in your favourite game, or choose one of nearly 200 electronic gaming machines for a solo hunt.